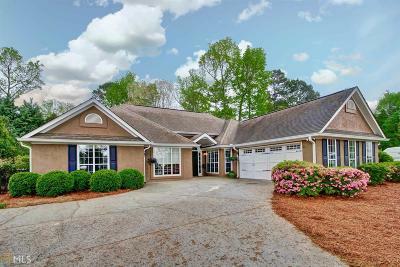 STUNNING ranch with a POOL & views of LAKE MCINTOSH! Fall in love as you step through the door of this beautifully renovated home! A sunny living room leads you to the gorgeous chef&apos;s kitchen with exotic granite, Chicago brick flooring, classic cabinetry, & a farm sink. The kitchen opens to a huge family room with built in bookcases & double fireplace with custom mantels opening to a den adjacent to a guest suite-perfect for visitors, teens, in-laws or a private office. Two more guest baths adjoin the additional guest bedrooms, & an AMAZING owner&apos;s suite awaits! You will love the newly renovated bath & its own patio entrance! Step through the patio to your oasis: An inviting pool with water feature & complete privacy! So much NEW in this entertainer&apos;s dream! Directions: From 74/54 South To Kelly Drive. Right On Kelly, Left On Terrane, Right On Crimson, Left On Cimaron. Home Will Be On Your Left In The Cul De Sac.